The Green Man and the Village lads bringing in the Beltane Pole. 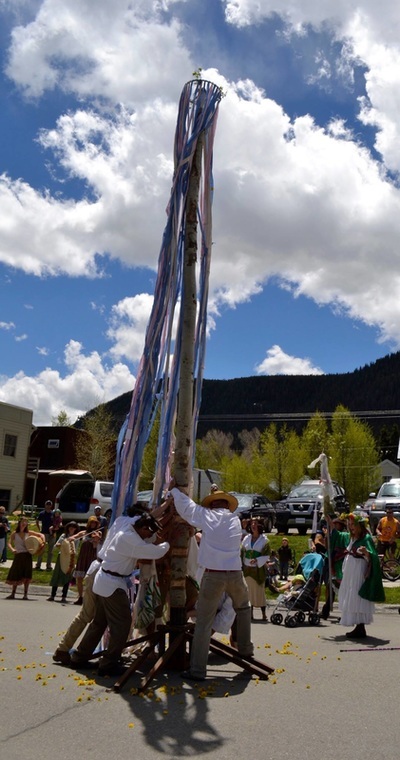 ~ Join the Earth Wisdom Mystery School Sacred Celebration Artists and the intergenerational community of Crested Butte, Colorado for a true Mountain Ceremony in honor of the rising of the sap and the return of the Green Fires of Summer. ~This is the seasonal celebration of Winter's final releasing and the full return of the Sun and the warming of Mother Earth. For a communtiy 2 miles up and at the very end of an isolated, pristine mountain valley, the snows do not leave until early June. 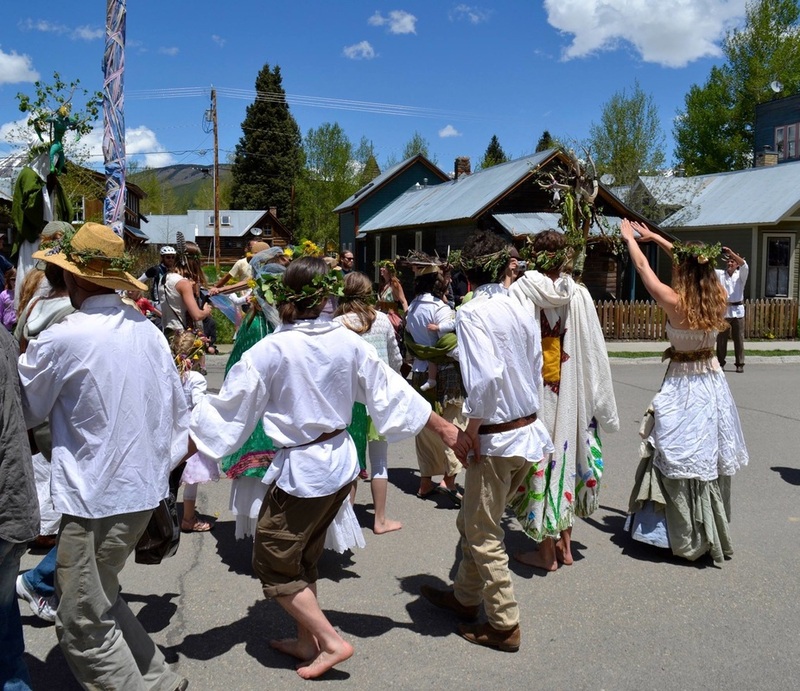 ~Early June is the natural time for a Mountain Beltane. Now the cattle are being brought to the lush mountain meadows of the high country. The newborn foals, calves and lambs are dancing in the pastures. 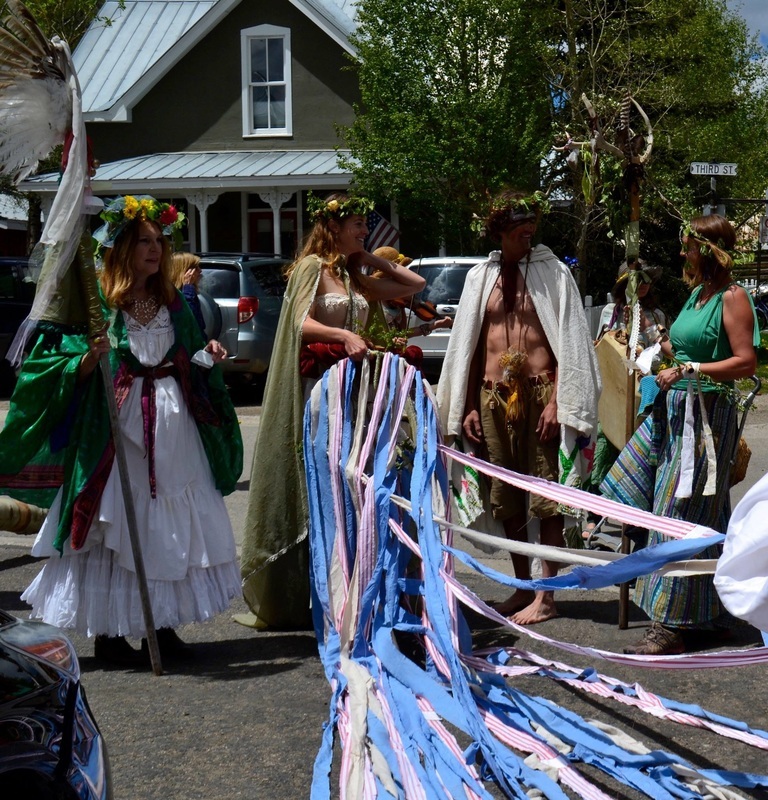 The elk and deer are gathering in the fields all along the rushing rivers and streams. Water is flowing from the mountain peaks as the snow melts and the Land drinks! 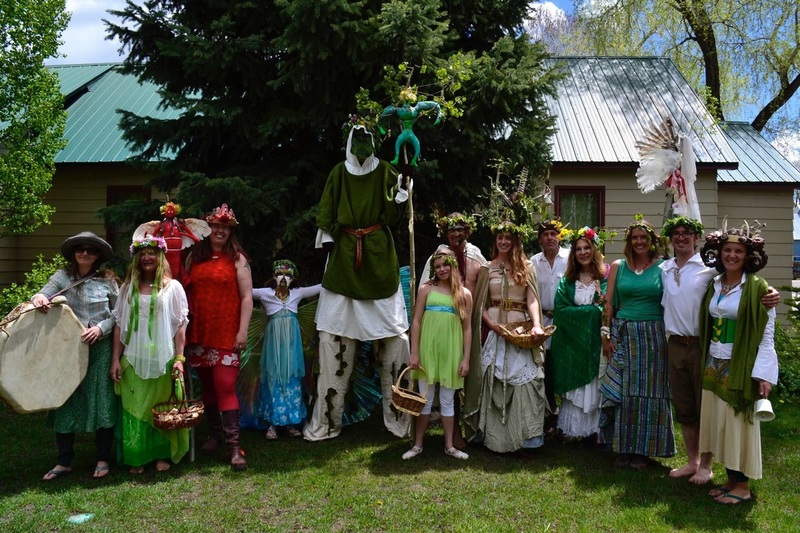 ~This is the heralding of Summer by our local Green Man, grown tall and strong, and beloved by all the community. 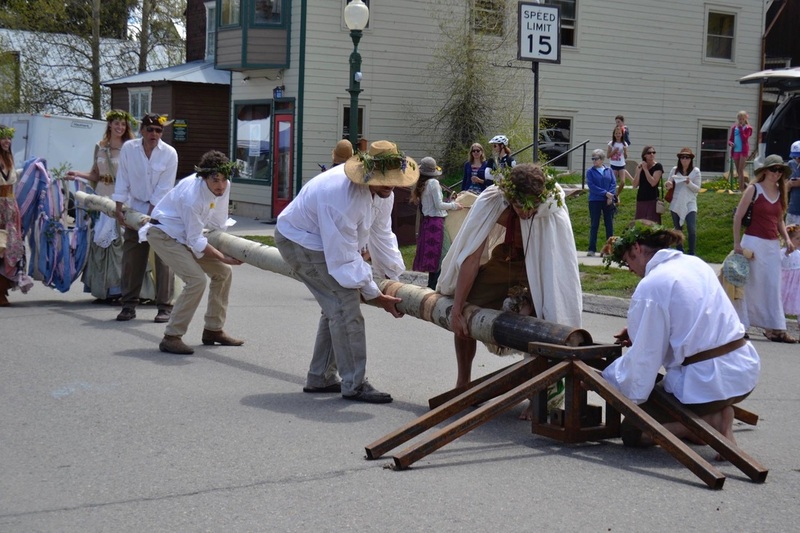 Chosen last Fall by the Maidens and Men during Vinotok, the Mabon/Samhain Celebration of the Autumn Equinox, he represents the lusty freedom of the Wild. 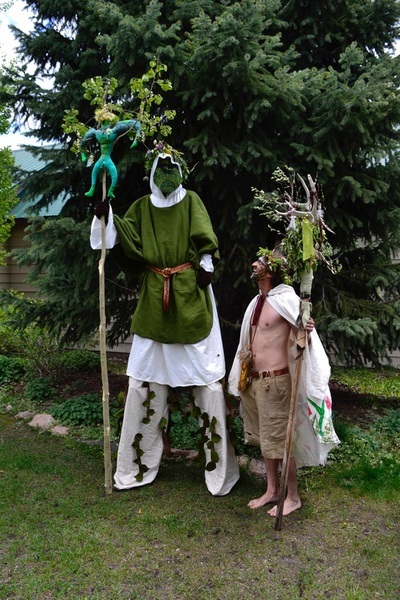 He is the joyous Father of forest and field. He will join the Green Goddess and her baby born in the Autumn. 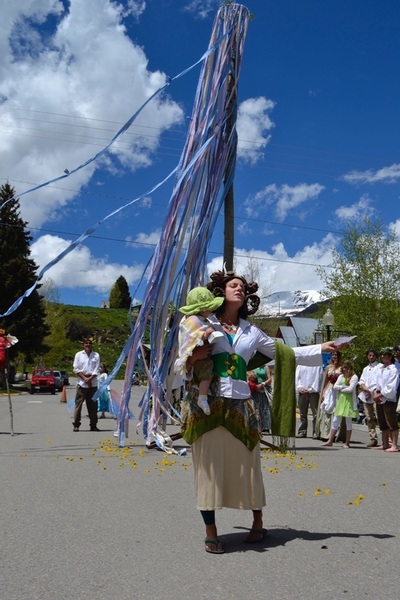 Chosen as the Harvest Mother in the Autumn when she was very pregnant, the Green Goddess is the embodiment of Gaia, the fulsome, generous and abundant Mother Earth. ~The Beltane Tree has been sought in the nearby forests by the men of the village. The women and children have woven long strands of ribbon and leaves with which to deck the Beltane Pole. 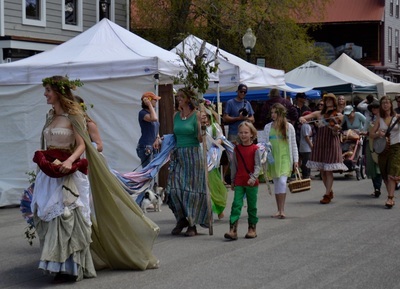 Led by Robin 'o' the Green, the mysterious Procession of the Boughs and Bells wends its way through the Market Place at the center of the village. 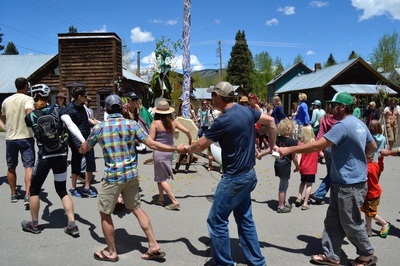 ~Here, the women and the men, the children and the elders of Crested Butte raise Yggdrasil, the Tree of Life, and the Green Man and musicians will serenade the Green Goddess. In the breaking of bread and Communion they share with each other and the villagers, we welcome the balance of all life. 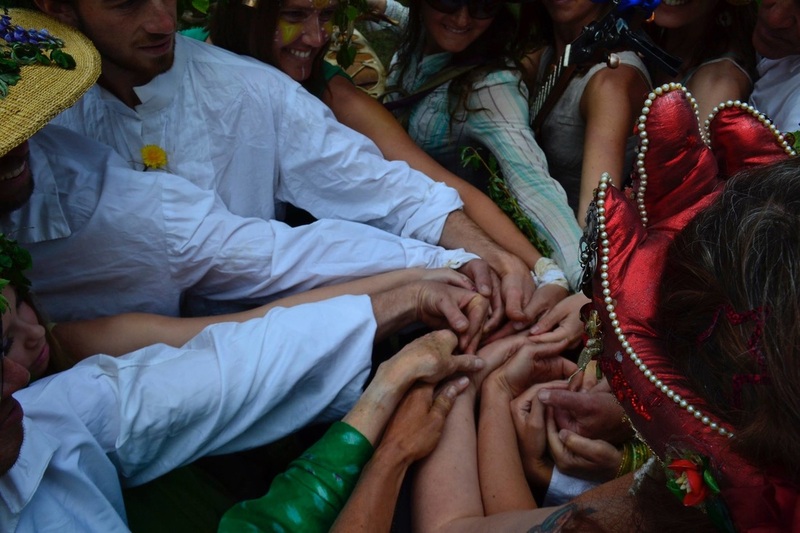 This is the meeting and melding of the Sacred Feminine and the Sacred Masculine, of the Green Spirit and Fire of Summer. As Above, so Below. As Within, so Without. ~ We are joined again in our interconnection and loving commitment with all of Nature! 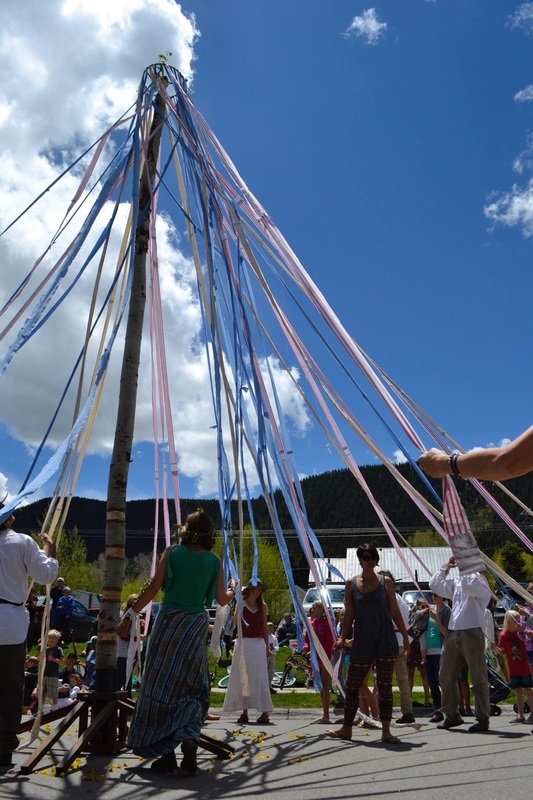 As the Beltane Pole is raised in the heart of the Village, all the Spirits of Nature are invited to gather in the Circle. 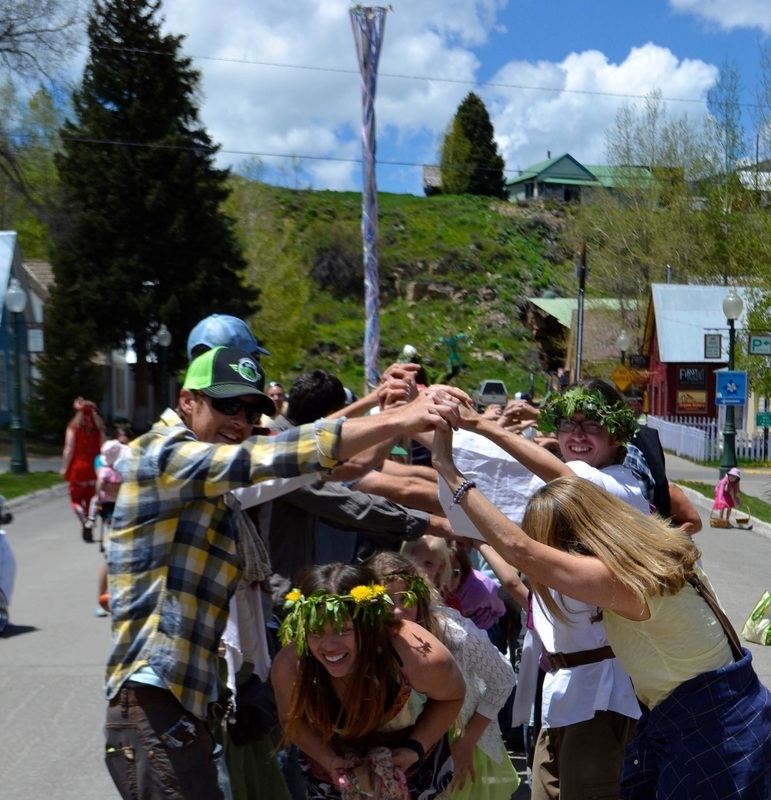 The Sacred Wilderness which surrounds our village is called to join the ceremony. 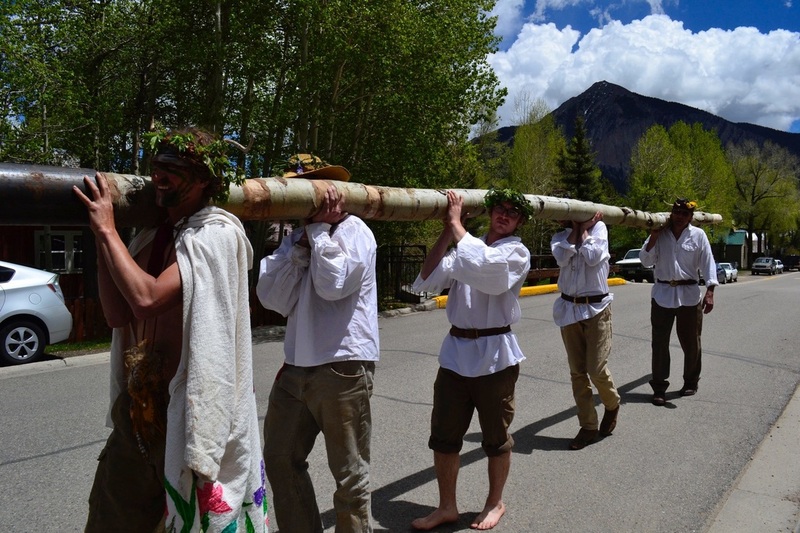 We honor the Red Lady, our Mother Mountain into which Crested Butte is nestled. 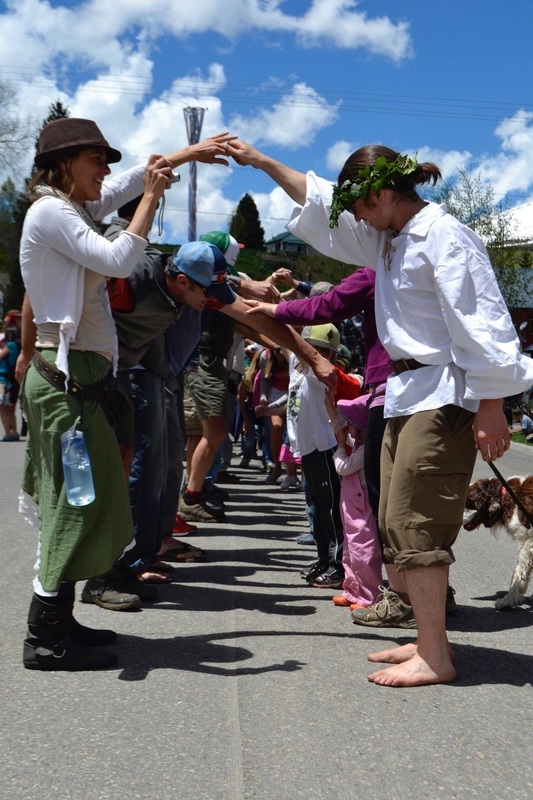 ~We pledge our ever-renewing allegiance to, and protection of the Natural World and environment in which we dwell. As the fiddle and drums rev up and the ribbons of the Beltane Pole are taken in hand , we dance for Life, for Joy and for the privilege of being part of the ever-turning, transforming Mystery.